Concerned netizen and prominent political analyst on social media, Adolfo Mortera exposed the alleged new tactics and strategies of Mar Roxas to win in the hotly-contested senatorial race in 2019. In a lengthy post, Adolfo Mortera asked if "Mar Roxas' Makeover is working. According to Mortera, Mar Roxas has employed new ways to change public perception of him as an arrogant, self-righteous deep yellow bureaucrat into someone humble, caring, non-partisan, and empathetic. 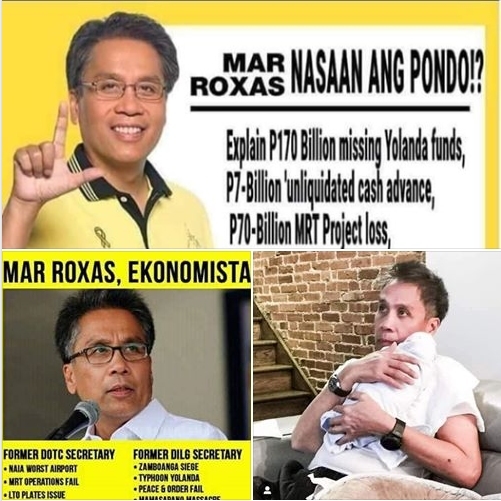 Another strategy of Mar Roxas is his solo campaign to shed off the yellow tag which people associate with incompetence and corruption in the Aquino administration, Roxas has been going solo in his sorties and has never been seen with his Otso partymates in a single stage. IS THE MAR ROXAS "MAKEOVER" WORKING? 🇵🇭For his May 13 midterm senatorial campaign, Mar Roxas has employed new ways to change public perception of him as an arrogant, self-righteous deep yellow bureaucrat into someone humble, caring, non-partisan, and empathetic. 🇵🇭SOLO CAMPAIGN. 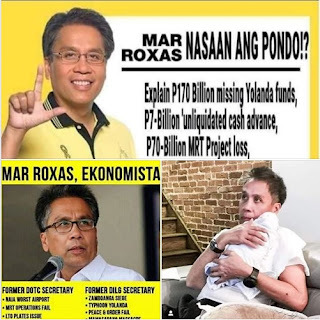 To shed off the yellow tag which people associate with incompetence and corruption in the Aquino administration, Roxas has been going solo in his sorties, and has never been seen with his Otso partymates in a single stage, even during the LP rally at the People Power monument last Feb. 25. It could be a ploy to avoid footing the bill for Otso's campaign expenses, he being the wealthiest in the group, or he was advised by his handlers to temporarily break away from the yellows, at least for now, in order to gain the votes from DDS supporters. 🇵🇭I don't know if this strategy is succeeding, but if we are to believe the latest Pulse Asia survey, it probably does, as he jumped from the fringes into 8-12 rank, leaving behind Bam Aquino outside the top 12. This is probably the reason why there's a fallout between him and Bam, according to reports. 🇵🇭A "HUMBLE" MAR? Another visible image engineering Mar is using is to feign humility and downplay his arrogant character. Despite frontal tirades he got from PRRD on at least three occasions, Roxas chose not to hit back and instead issued motherhood statements like "my priority is serving the people." 🇵🇭This works both ways: nurture a humble image, and at the same time - by being silent - avoid provoking the administration into pursuing the graft and plunder cases against him related to Yolanda funds, MRT, overpriced Mahindra vehicles, billions worth of unliquidated cash advances, etc. 🇵🇭Unlike the clueless Robredo, Roxas has never criticized the President before and during the campaign, and this has to do with the corruption charges against him. This time, he is "in character": a coward when challenged by someone with balls. 🇵🇭GOODWILL VOTES? One news that surprised everyone is his first-born twins, delivered by a miracle through surrogacy. Whether his babies will earn him goodwill votes is another matter. But if one is to believe babies are a blessing, let's ask Koring. 🇵🇭Back to the question: Is the Mar Roxas "makeover" working? Probably yes, because he is now in top 12 of Pulse Asia's mind-conditioning survey. But most probably no, because his being there is not an isolated leap from behind, as most of reelectionist senators are also with him in the circle. Blame the result on lazy survey respondents who wrote only the names of candidates they can recall vs newbies like Glenn Chong, Larry Gadon, and Willie Go, among others, and on the survey administrators who MAY HAVE fed them names they personally prefer. 🇵🇭ONE DICTUM: OLD HABITS DIE HARD. DON'T BE FOOLED BY IMAGES YOU SEE. REMEMBER WHAT HE WAS AND WHAT HE DID AND JUXTAPOSE THOSE MEMORIES OF HIM FROM 2010 TO 2016 TO THE NEW IMAGE HE IS FOISTING ON US NOW. 🇵🇭Mar Roxas can don all the colors of the rainbow, but he remains Deep Dilaw. We don't have short memories.